Live and die on this day . 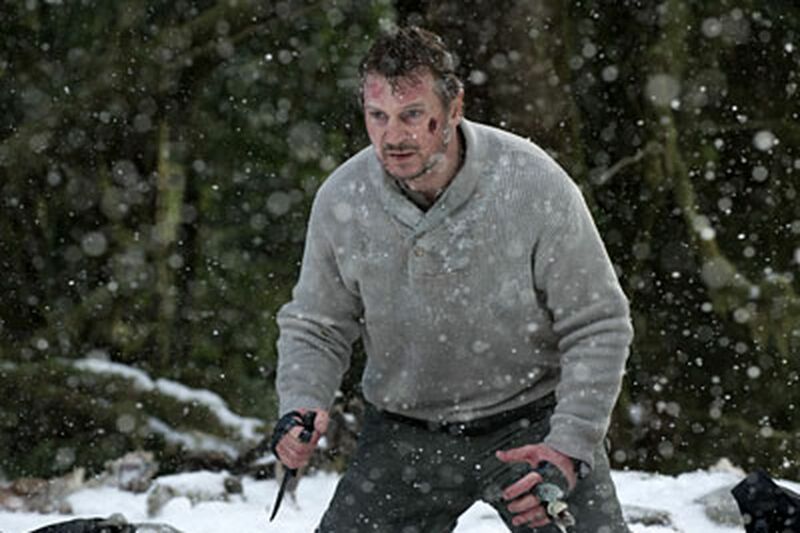 . .
Neeson is John Ottway, a damaged gent who works as a marksman for an oil-drilling team. If a predator - a bear, a wolf - gets too close to his coworkers, Ottway takes out his rifle and lays the creature down. It's "a job at the end of the world," Neeson says in his introductory voice-over, and, as we discover, there's a reason he's chosen to live in such bleak, bone-chilling ways. Until one day when, after a few stiff drinks, he decides he doesn't need to live this way - or any way - anymore. He takes his gun, goes out into the blizzarding night, and puts the barrel to his mouth. But that doesn't happen, either. The Grey, directed with macho vigor by Joe Carnahan (The A-Team, Smokin' Aces), soon finds Ottway on a plane with a bunch of rowdy and uncouth colleagues. It's an R & R flight, but the aircraft hits turbulence and then goes nose down, turning into a D & D - death and destruction - trip. The crash is one of the more harrowing cinema reenactments of an aviation nightmare, from the eerie silence when the engines shut off and the windows fog up to the hard jolts of the fuselage breaking apart. The Grey isn't likely to be on any airline's in-flight entertainment menu. There are seven men who survive the crash, and then there are six, and so on. Ottway, thanks to his training as a hunter and the fact he's the lead guy in Carnahan's script, takes charge, trying to figure out how to get through the fierce, frozen forests - and how to avoid being eaten by a pack of seriously angry wolves. Mixing CG effects, puppeteering, and real trained animals, these snarling canids are kind of scary - they're like Twilight's pack of shape-shifting wolves, only without the Team Jacob T-shirts. And, excuse the pun, they dog Ottway and his quaking crew (Dallas Roberts, Frank Grillo, Dermot Mulroney) relentlessly. The Grey, whose clipped title, grim swagger, and lost-in-the-outback themes conjure up visions of that Alec Baldwin/Anthony Hopkins classic, The Edge, devolves into a predictable man-against-nature, and man-against-fellow man, affair. There are witty nods to other such films (Werner Herzog's Grizzly Man, Ethan Hawke's Andes plane crash-cannibal tale, Alive), but the wit stops there. The stunts become more preposterous, the computer-rendered snowy chasms more impossibly fake, the haunted look in Neeson's eye more tragic and soul-torn.